Published in Astronomer's Telegram No.1134. V4641 Sgr is known as a detached binary containing a 9 Msol. black hole and an A0 type companion. Its orbital period is 2.81728 day. The light curve has a double-wave shape with two minima of unequal depth, the deepest minimum coincides with the inferior conjunction of the black hole at the epoch of T_0 = JDhel.2451764.315. 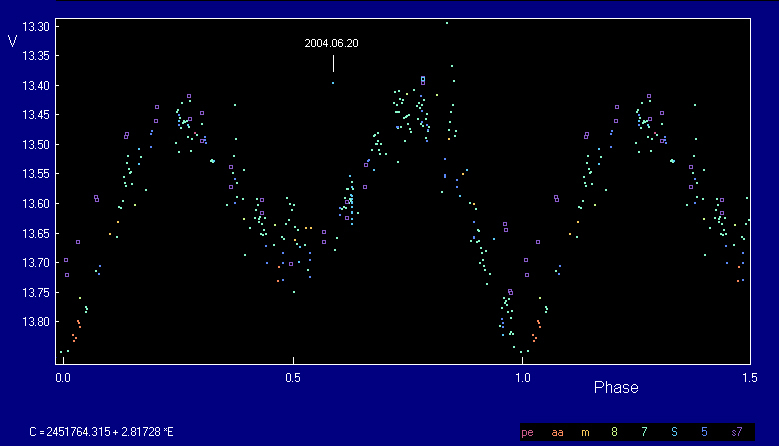 Y. Maeda (vsnet-alert 9360) reported the brightening of the star up to 12.8 mag on 2007 May 20.7 UT, but P.F. Williams (vsnet-alert 9360) noted that the star was in its normal brightness of about 13.3 mag the day before and after. Spectra of V4641 Sgr were taken by us using SAO 1-m telescope between May 23.972 and 24.002 UT (the orbital phase of 0.35), wavelength range 3900-7500A, resolution 8A, S/N~30-40. A0 type companion is seen with the H_alpha absorption line more shallow than in the quiet state being filled by emission. Additionally we performed accurate CCD V and R_C photometry in 16 nights between June 5 and 25 using 60-cm telescope of Sternberg Institute's Crimean Station and SAO 1-m telescope. These observations show essential light excess over the quiet light level seen only in the orbital phases between -0.25 and +0.25 with the maximum value of 0.15 mag in the V band at the black hole inferior conjunction. The excess is absent in other orbital phases. This phenomenon has not been observed previously. We treat it as irradiation of the area of A0 star facing to the black hole. The area re-emits faint X-ray radiation of the black hole in optical bands. Probably, this source of X-rays ionizes the rarefied gas around the black hole and forms the emission excess in H_alpha. Fig. 1. The light curve of V4641 Sgr in the V band. The signs with different colors are the following observations: pe and aa - old photoelectric photometry at Sanglock (Tadjikistan) and Tien-Shan (Kazakhstan) Observatories; m - data published by J. Marti et al. (IBVS No.5036); 7, s7 and 8 - CCD observations with SBIG ST-7 and ST-8 cameras and 60-cm reflector of SAI Crimean Station; 5 - CCD observations with MEADE Pictor-416 camera and 50-cm Maksutov telescope AZT-5 of Crimean Station; S - CCD observations with EEV 42-40 chip based UBVRI photometer and 1-m telescope of SAO. Observations taken in 2007 June are marked with squires. Fig. 2. The spectrum of V4641 Sgr taken on 2007 May 23 with SAO 1-m telescope. Yellow lines point to Balmer lines. H_alpha excess at 6563A is evident. Fig. 3. The comparison of two normalized spectra of V4641 Sgr. Top: 2007 May spectrum in the active state. Bottom: 2001 July spectrum in the quiet state.